Recently, in Northern Illinois we have not had much to celebrate, but it has been a great time for professionals in the weather forecasting field. Considering the tools available to forecasters, it is hard to understand that they often cannot predict the weather 24 hours ahead of time. Personally, I feel that we might as well rely on the groundhog to predict the weather. This year as is the custom on February 2 at Gobbler’s Knob in Punxsutawney, Pennsylvania, people watched the groundhog deliver his forecast. Good news! Punxsutawney Phil did not see his shadow, predicting an early spring. My forecast is also for an early spring which is worth as much as those forecasts by our weather professionals. In the future let’s combine Groundhog Day and National Weatherperson’s Day since they both have a lot in common – both are right 50% of the time! This entry was posted in Uncategorized on February 5, 2019 by Good Day Illinois. Trump will agree to reopening the government, and agrees to discuss the wall later if the Democratic leadership will sign the following. There should be no walls or fences on our southern border. A line in sand on the southern border will be enough. In fact, it will be called the Obama border line, and you know what that means. There should be no check points on the southern border since the border should be open to all who wish to come in. Nancy Pelosi agrees to personally apologize to each family who has lost a loved one to an illegal alien. Border patrol agents should give up their firearms, and be reassigned to leading the hordes of immigrants coming through Mexico to the United States. Since the new Governor of California wants to open the borders, all immigrants arriving from Mexico will be housed at the expense California with temporary residences built for them in Sacramento, California. And finally, Nancy Pelosi and Charles Schumer will spend one month living in tents on the Arizona border with no armed protection or staff. The democrats should have no problem signing this statement of beliefs because it is all true. And finally, the democrats will get their wish, no money for the wall! This entry was posted in Uncategorized on January 21, 2019 by Good Day Illinois. The country will observe a National Day of Mourning on Wednesday, honoring the 41st president George H.W. Bush. He died at age 94 Friday night, November 30. Days of mourning usually recognize former commanders-in-chief and involve memorial and remembrance events. How it can affect you? The U.S. Postal Service will not deliver regular mail. All post office locations will be closed, too. Limited package delivery will continue to avoid setbacks during the busy holiday season, however. 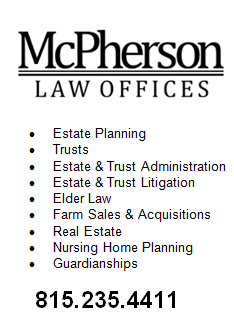 McPherson Law Offices will be open since the private sector must work to pay for all of the government closing. This entry was posted in Uncategorized on December 4, 2018 by Good Day Illinois. How lucky we are to have such beautiful public golf courses in Freeport, Illinois. When playing the East Course, pay particular attention to the 16th hole! This entry was posted in Uncategorized on July 16, 2018 by Good Day Illinois. CITY MANAGER OF FREEPORT, ILLINOIS SAYS NO MONEY TO REPAIR STREETS! The Freeport City Manager in his column in the Journal Standard on May 19, 2018, says it would take the City 100 years at the present repair rate to bring the streets up to standards (whatever that means). On March 5, 2018 it was stated in Good Day Illinois that at the February 20, 2018, the Freeport City Council approved spending $32,250 for pothole software this year (2018), and then $19,250 each year thereafter to maintain the software. I say cancel this contract. How can the City spend over $200,000 in the next ten years on pothole reporting software when there is no money to fix the streets? This City Manager with the collaboration of the Council is playing the taxpayers of this City for fools. Oh well, what’s new. Enjoy paying your real estate taxes. This entry was posted in Uncategorized on May 30, 2018 by Good Day Illinois.